Rainbows are a beautiful phenomenon that bear significance across different religions and cultures. Rainbows usually occur after a storm or rain shower, and they are the result of refracted sunlight hitting raindrops. This produces the optical appearance that is a rainbow. While the sun often shines after a rain shower, conditions are are not always perfect to produce the appearance of a rainbow. For this reason, rainbows are considered special across many religions and cultures. Because of their rarity, rainbows hold significance in many religions and cultures. In Christianity, a rainbow was seen after the Great Flood was set upon the Earth by God to cleanse sin and evil from the world. It is believed that the appearance of a rainbow after a storm is a sign that God will not destroy the world again by flood. There is also mention of a rainbow in the book of Revelations which uses the rainbow as a sign of the second coming of Jesus Christ. Throughout Native American culture, the meaning and significance of rainbows varies depending upon the tribe. Some tribes believed that rainbows were the bridge between the spiritual and human world. This is sometimes referred as the “Rainbow Bridge”. Other tribes believed that rainbows were a symbol of healing goddesses. The Cherokee Indians believed that rainbows were a representation of the hem of the Sun god’s coat. Mayan Indians held a similar belief to Christians in regards to rainbows as they believed that after their world was destroyed by fire rain the appearance of a rainbow meant that the gods were no longer angry. There are some cultures/religions that believe the rainbow represents the elements or the directions of the Earth. In Islam, rainbows only consist of four colors-blue, green, red and yellow-which correspond with the four elements water, earth, fire and air. The Buddhists believed that the seven colors of the rainbow represent the seven continents of the Earth. The ancient Arabians attributed the appearance of a rainbow as a gift from the south wind. In many cultures rainbows were a sign of luck or a gift from the gods. As many know, in Irish culture, a rainbow is synonymous with elusive pots of gold and leprechauns. Poland also shares the same belief with Ireland about the pots of gold at the end of the rainbow. However, in Polish culture the pots of gold are a gift from angels. In many cultures, rainbows are a sign of pathways, messages or messengers. In Roman culture, rainbows were believed to be the pathway taken by Mercury the messenger god. In Norse tradition, rainbows became the pathway or bridge that only celebrated fallen warriors, royalty or gods could cross. While many religions and cultures view rainbows positively, there are some instances were rainbows are seen as negative symbols. In many of these cultures rainbows were associated with dark spirits or demons. In both Honduras and Nicaragua, people believed that rainbows were a sign of the devil, and it if they looked at a rainbow a curse would be placed on them. In Amazonian culture, rainbows are associated with less desirable spirits that cause miscarriages and skin disorders. While rainbows have significance as a whole, each color has its own significance. Red is the first colored arc of the rainbow and because of this it has the longest wavelength. In Christianity this arc corresponds to Archangel Uriel which represent wisdom and energy. In modem day Buddhism and Hinduism, the red arc corresponds with the base or Muladhara chakra which is the first chakra that connects or “grounds” a human being to the physical plane. Orange is the second colored arc of the rainbow. This arc is a mixture of the colors before and after it-red and yellow. In a rainbow, orange represents creativity and the ability to enjoy oneself. Based off the chakra system, the orange arc represents Swadhisthana which is the energy associated with fertility, sexuality and creativity. Yellow is the third colored arc of the rainbow. This arc is associated with Archangel Jophiel which represents the brilliance of wisdom and thoughts. Within the rainbow, yellow represents the brilliance of the sun. Within the chakra system, the yellow arc corresponds to the Manipura chakra which is the seat of man’s ego and personal power similar to how the sun feeds the earth. Green is the fourth colored arc of the rainbow. This arc is associated with Archangel Raphael which is used for healing. Within in the rainbow, the green represents health, wealth, and love. Within the chakra system, the green arc represents Anahata which is the heart chakra where the ability to give and receive love is processed. Blue is the fifth colored arc of the rainbow. This arc is associated with Archangel Michael. Archangel Michael is the leader of all the archangels and represents spirituality. Within the rainbow, the blue represents connection to water and the spirit world. Within the chakra system, the blue arc represents Vishudda which is the throat chakra and the ability to communicate with purity. Indigo is the sixth colored arc of the rainbow. Within the rainbow, the color indigo represents a bridge between the conscious and subconscious worlds. Within the chakra system, the indigo arc is the Ajna chakra which is represented by the third eye and the ability to see the unseen on the spiritual level. Violet is the seventh and final colored arc of the rainbow. This arc is associated with Archangel Zadkeil which represents mercy. Within the rainbow, the color violet is a mixture of red and blue and represents the access to the imagination and Divine inspiration. Within the chakra system, the violet arc is the Sahashara chakra which is coincides with the point where human consciousness connects with the Divine or spiritual consciousness. Rainbows are one of the most beautiful phenomena steeped in a deep history that spans all cultures and religions. Can i use this image on a product for resale? Hi, can I use this image on my blog? 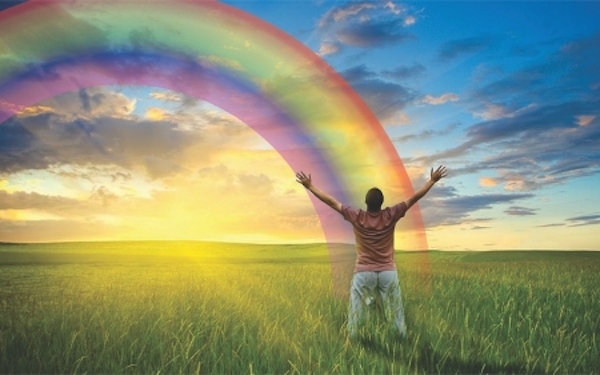 Wanting to order a print of rainbow picture with back of person with hands raised. How can we do that?